There will be a standup comedy show in Riyadh and Jeddah in the next few days. 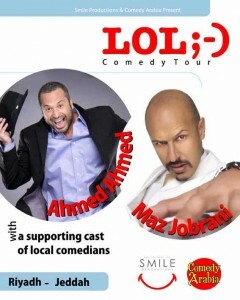 The event will be starring Ahmed Ahmed and for the first time in Saudi Arabia, Maz Jobrani. Each ticket will cost 350SR. It will be on 3rd June 09 in Jeddah and 4th & 5th June 09 in Riyadh. Find out more at the SmikeKSA website. Click through to see a video of Maz Jobrani’s standup comedy. 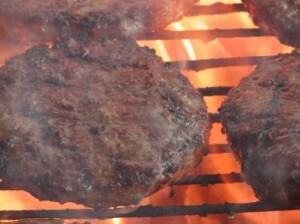 60 Celsius (140 Fahrenheit) degrees are used to cook rare steak. Hmmm. Head of the physics department in KFUPM Doctor Ali Alshikri said that the temperature over Riyadh and the Eastern Province will be “HOT HOT HOT” and could reach up to 60 degrees Celsius (that’s 140 Fahrenheit) between 11a.m. to 2p.m. This will happen in 26 days (21st of June 2009). I hope you have summer plans away from Riyadh. Update: Oh look, I’m on GlobalVoices. Remember to register for the second Riyadh Tweetup next month. We talked earlier about Gitex participation. Here is the full showroom floor map. As expected it is dominated by STC and Mobily. You can watch the whole PDF map here. Arab Tech TV will provide live streaming from Gitex at 7 p.m. You can watch the stream here. Shufflegazine from the UAE is covering Gitex as well. You can follow their images on their Tumblr page. They showed this picture which was taken recently and Gitex preparations were not complete. That must be good …. Riyadh Exhibitions Company has finally updated their website just in time for Gitex Saudi Arabia 2009 in Riyadh. Probably not the best design but it is an improvement over the old one. As usual it’s mainly a shopping exhibition: Gitex Saudi Arabia 2009 and Gitex Saudi Arabia Computer Shopper 2009. I am not looking forward to “WAP Technology” and “ASP Business Host”. When is the event? Gitex Saudi Arabia will be from the 19th to 23rd of April 2009. How to get to the new exhibition building? Just follow the direction on this link (even though it claims it is in Lebanon for some reason). Who are the participants? As usual STC and Mobily (Saudi Arabia’s biggest telecommunication companies) are participating. Which I think is a bad idea and a waste of space. I was given a list of participating companies which you can find in this PDF file. I have been extremely busy with some family matters so I don’t think I might be even able to attend. You will be able to find coverage at Tech WD (Arabic tech website). A malfunction in one of the servers in the main STC Olaya switch box in Riyadh caused a large amount of disconnections (35-45% of the subscribers in Riyadh). The malfunction happened Saturday 21st of March 2009. Alriyadh newspaper reported that STC was working on fixing it since Saturday. They also contacted the spokesperson for CITC (Communications and Information Technology Commission), Sultan Almalik and he said that he have no information about the malfunction! From Alriyadh newspaper (Arabic link). Riyadh Exhibition’s site down before Gitex Saudi Arabia 2009? And just one month before Gitex Saudi Arabia 2009 which will be held in Riyadh between April 19th to April 23rd 2009. This will be the first Gitex Saudi Arabia in the new Riyadh Exhibition building which is roughly double the size of the older building. Here is a map of the new Riyadh Exhibition building. We will talk more about Gitex Riyadh 2009 in a few more days. Hopefully it won’t be as disappointing as last year’s. According to warnings on AccuWeather’s website and iPhone application (see below). There is a thunderstorm (T-storm) expected over Riyadh today. Update: It appears that AccuWeather got it wrong. Here’s a video I found with today’s Sandstorm over Riyadh, Saudi Arabia. You can watch more videos submitted to iReport.